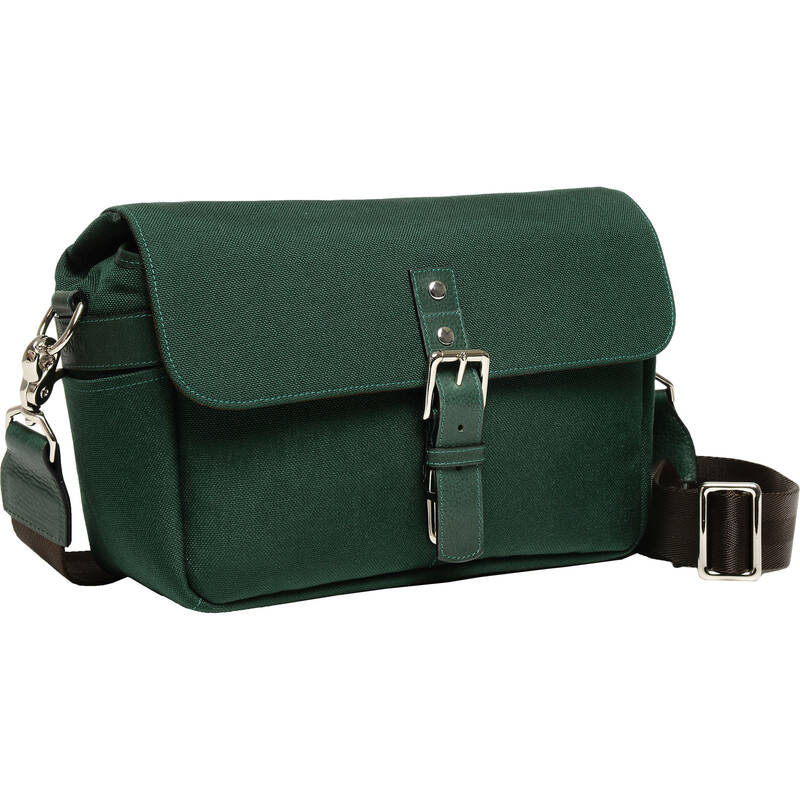 This forest-colored Passion Passport Bowery Camera Bag from ONA is a stylish carrying option with brass and leather accents that features durable, lightweight nylon construction. It can accommodate a DSLR or mirrorless camera with 1-2 lenses and any personal items that you can place within it. For impact and shock protection, the bag's non-scratch interior is padded with closed-cell foam. An included touch-tab divider can be adjusted to create two interior sections of equal or varying lengths. With or without that insert, the Passion Passport Bowery bag can also be used as a compact shoulder bag. However you choose to use the Passion Passport Bowery Camera Bag, the contents can be secured with its front flap which is attached to the bag itself using both a sturdy brass buckle and a tuck lock. For items that need to be accessed quickly and conveniently, such as a map or a small notebook, the bag's rear side features a spacious slip pocket. Two side pockets can each carry a smartphone, lens caps, memory cards, camera batteries, or other similarly-sized accessories, and two front pockets whose openings are covered when the flap is closed can be dedicated to items that require additional security. A shoulder strap provides the ability to wear the Passion Passport Bowery Camera Bag alongside or across the body. The strap's brass swivel snaps allow it to detach for placement of the bag within a larger container or case. Box Dimensions (LxWxH) 15.3 x 11.6 x 7.5"
Passion Passport Bowery Camera Bag (Forest) is rated 5.0 out of 5 by 1. Rated 5 out of 5 by Nicholas from Wonderful Bag and Great Color I am the proud owner of several ONA Bowery Bags. I really did not need another one but when I saw the colors offered, I had to order the Sea (Blue) one. Great quality and stylish. I would recommend ONA bags to anyone.